SYNDENT Tools one of the pioneer and market leaders in the manufacture and distribution of abrasive tools in China with the ISO and MPA certificate has one of t he widest ranges of abrasive tools in the world. We were established in China since 1996. As one professional abrasive tools company, we can supply many kinds of abrasive tools including variety of the products from the reputable firms. We have developed and expanded into a full range of surface process products to meet the requirements of industrial manufacture. This product range offers the complete service from high stock removal to development of a mirror finish. We have our main products such as vitrified, resinoid, metalic & electroplated, grinding and cutting wheels, cutting tools, coated abrasive tools, super abrasive wheels, diamond wheel, saw blade, tungsten carbide burr, mounted point, and many other products that suitable for cutting, grinding, polishing. ●RESIN BOND GRINDING AND CUTTING WHEEL: - DEPRESSED CENTER WHEELS, CUT-OFF WHEELS, AND FOUNDRY WHEELS. ●DIAMOND / CBN WHEELS: - RESIN AND METEAL AND VITRIFIED BONDED WHEEL. ●DIAMOND SAW BLADE: - SINTERED, BRAZED, LASER WLEDING & ELECTROPLATED. ●DIAMOND CORE DRILL BIT: - SINTERED, BRAZED, LASER WELDED & ELECTROPLATED. ●DIAMOND CUP WHEEL: - SEGMENTED, CONTINUOUS, TURBO, ELECTROPLATED. ●ELECTROPLATED DIAMOND TOOLS: - WHEELS, FILES, MOUNTED POINT, ETC. 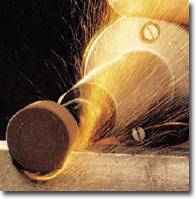 As the leading supplier of abrasive grinding and cutting tools, we emphasize on the best quality of the products for the customers who demand the best. So we quickly developed a good reputation for the precision products in its product range. Our products have been exported to USA, UK, Germany, Spain, Australia, New Zealand, Middle East, South-East Asia etc. more than 20 countries and regions. SYNDEN Tools are committed to offering their customers superior products supported by top quality service. To win the market by science & technology, and obtain the credit by brand and service quality are the ever-lasting pursuing of Synden people.